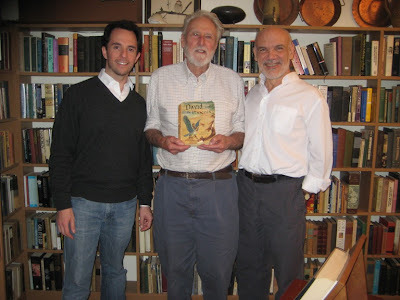 Finding out that Edward Ormondroyd, author of the 1957 YA novel David and the Phoenix, was still with us (at age 86) was a highlight of my summer. Contacting him and convincing him to let me interview him for my blog was as well. Yet in terms of moving experiences, both turned out to be mere prologue to the Edward-related event that unfolded in Trumansburg, NY, on 12/2/11. I believe it is unprecedented in the known history of author visits at schools. Like the fabled Phoenix of his book, Edward (as author) has risen again, and it didn’t require a pyre or fire of any kind. In the interview, Edward said that, but for two “unofficial” (my term) exceptions, he never spoke in schools, as many children’s authors do today. A humble and happy man, he didn’t say this with any discernible hint of regret or longing, but I saw an opportunity just the same. 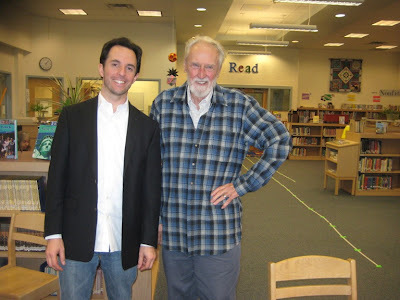 By pure, freakish chance, at the same time I had been tracking down Edward, I was also booking an author visit at Trumansburg Elementary in Trumansburg, NY…which, I would soon learn, happens to be the town in which Edward lives. Yet apparently, the fact that he is a published author is largely unknown among the townsfolk. More broadly, David and the Phoenix remains beloved by certain adult readers yet largely unknown among the current generation. I believed kids and Trumansburgians alike would be most interested in Edward’s books and in Edward himself. So I asked Purple House Press, the exclusive publisher of David and the Phoenix, if they would discreetly donate copies of it to the school so the kids could take turns reading it in the month leading up to my appearance. The publisher kindly obliged and sent 30 paperbacks at no charge. The kids were not told that their assignment to read Edward’s novel had any connection to my upcoming author visit. Edward had already planned to attend my talk—anonymously, he thought. But about halfway through, I ambushed the whole room. I flashed a picture of David and the Phoenix, citing it as a childhood favorite. I innocently asked the kids if they knew the book. As I suspected, their reaction was excitement—and disbelief: what are the chances this guest author would mention the very book by an unrelated author that they all just so happened to read? Then I announced that Edward just so happened to be in the room. I gestured to him to “introduce” him to the crowd—a surprised author greeting surprised fans...for the first time. He stood and endearingly bowed. For the Q&A segment with which I close my program, I encouraged students to ask questions of either of us (not having cleared this in advance with Edward). To my great pleasure, upon hearing this, quite a few kids turned to Edward and shot up their hands. Edward’s wife and friend had accompanied him; later, his wife said Edward was touched and his friend said seeing Edward get such long-deserved attention brought tears to his eyes. Edward told me he had not thought I would involve him in my presentation, let alone even mention him. As if this weren’t memorable enough, the Ormondroyds kindly invited me to their house for dinner (featuring vegetables they grew themselves) that evening. Adding to the honor, fellow author Bruce Coville (whom I’d run into online but never in person) joined us. The press release I'd sent began with this plea: “Due to the surprise nature of this event, please do not run story (or even discuss locally) until after!” The Ithaca Journal (the region’s daily paper) covered it; the Fox TV affiliate WICZ told me they would be there, but they were a no-show. The day prior, I had seen the film Hugo, in which a younger person shows an older person (silent era filmmaker Georges Méliès) who had a creative influence that he (the older person) is still fondly remembered. I felt like this Edward Experiment was a Hugo moment of my own. Special thanks to Trumansburg Elementary librarian Gail Brisson who eagerly agreed to take on this additional effort and who managed to keep the whole thing a secret for a month, even from Edward’s wife…who, it just so happens, volunteers in the school. Posted 12:00 AM Labels books by other authors, Edward Ormondroyd, persistence, personal history, school visit, where are they now? Oh, that's such an amazing end to the whole story. Except - it's not the end. Thanks, all. Tanita, yes, for starters, it would be lovely if even one of Edward's OP books would come back into print. Pretty fabulous stuff! Thanks for not only doing it but sharing it with us all. Thanks for taking the time to check it out, Gregory! A Hugo moment, indeed. How nice to be able to make that happen! Our family favorite is Time at the Top. I always loved "Time at the Top" and was afterwards extraordinarily kind to strangers. I have ever since imagined myself in the scenarios in the book and wondered how I might have behaved. In the spirit of E. Nesbit ( I read "David and the Phoenix" after "The Phoenix and the Carpet") and Edward Eager, I now look forward to reading the Nobleman oeuvre. Thanks a MILLION for finding out whatever happened to Edward Ormondroyd! Thanks Susan! I've forwarded your kind comment to Edward, who I know will be as touched as he's been by the other kind comments. This really brought tears to my eyes. 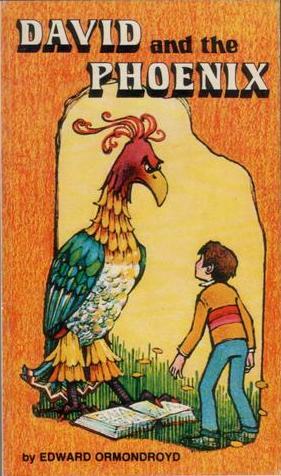 David and the Phoenix was my favorite book as a child, and is still in my top 5 most treasured works of art. Edward Ormondroyd has always been nearly as mythical to me as his creation, so it was wonderful to see him in your video and blog. He's always been such a humble man, but I hope he fully understands and embraces how much joy he has brought to so many of us. David, I love your comment and have forwarded it to Edward. Thank you. Marc - My name is Chris LaForce. I have watched this video several times, and it brings a tear to my eye every time. It was SUCH a wonderful and thoughtful tribute that you arranged for Edward Ormondroyd! I have since watched other videos of yours and searched for your books on Amazon ans elsewhere. As a lifetime comic book fan (I graduated from the Joe Kubert School in 1987), I'll have to pick up copies of your Boys of Steel and Bill the Boy Wonder! You sell yourself short: you have written an abundance of very interesting books on a myriad of intriguing topics! Another reason I decided to post here (I rarely do so), is that I am in the midst of writing a sequel to David and the Phoenix. My two youngest children talked (coerced is far too strong a word! :) ) me into it, and I've become engrossed in the process! (I've only had one work published so far, The Choynski Chronicles). I spoke with Edward on Jan. 23rd, and it was a wonderful conversation. Although I have yet to work out the details, I'm going to insist (after it goes to print) that Edward gets a share in any sales from the sequel. He is a wonderful man, and a GREAT author! I have since purchased and read copies of other works of his: Time at the Top (Showtime made their movie version in 1999), All in Good Time and Castaways on Long Ago! 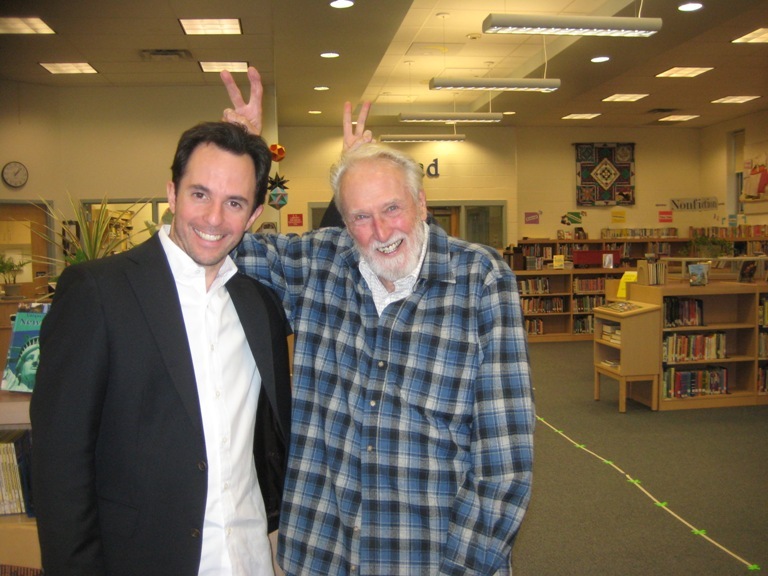 He is a magnificent writer of children's and young adult literature! BTW, since the subject has been touched upon in this Blog: A few of Edward Ormondroyd's books ARE available as reprints, at http://www.purplehousepress.com/. That's where I bought copies. My wife's 1958 copy of David and the Phoenix was getting a bit beaten up by my son, so I picked up a reprint copy for us to read over and over again. Thanks, Marc! I'll email you tonight! Jeffrey, hope you see this. Thanks for the kind message. I forwarded it to Edward and Joan who send their warmest regards in return. Greetings from a true fan of Time at the Top. In 1963 as a 10 year old girl, I lived in Lafayette CA and read your book many times. It was my absolute favorite. In fact I liked it so much that I took the initiative to write to Walt Disney to ask him to make it into a movie. Since I was 10, I added that I thought I would be a terrific Susan Shaw in the movie and I included my picture! (Little did I know that you had negative thoughts about Disney's adaptations of books.) I did receive a note back from the Disney Company -- "thanks, but no thanks". Alas, when my daughter turned 10 in 1994, I hunted for the book but could not find it. I wanted to share it with her, but found that the book was out of print. Recently, I found that it has been reprinted and have purchased three copies -- one for myself for posterity (and future grandchildren), one as a gift, and the third for a 10 year old in SF. I recently reread the book (loved it) and the sequel to make sure that I liked it as much as I did in the past. I was not disappointed! My mother, age 95, still lives in Lafayette. She is also a Cal grad (go Bears!) I will print out this interview and share it with her, as she remembers my efforts at publicizing your novel. She'll identify with your experiences at Cal. Thanks so much for your creative additions to the world of children's books.